The Boudicca Challenge. Norfolk & Suffolk cycling at its best. Visit the best cycling parts of Norfolk and Suffolk and experience a more laid back Tour. You will follow quiet lanes and byways of the National Cycle Network. 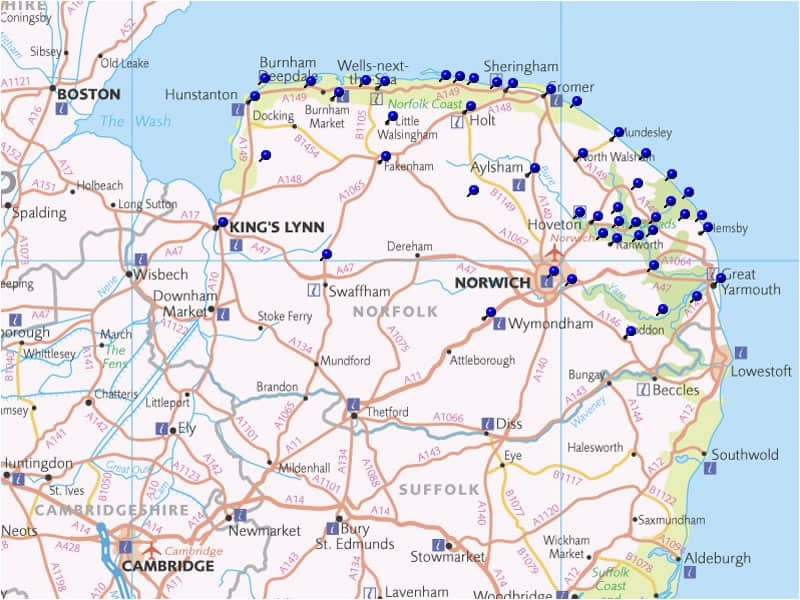 Explore the wonderful Norfolk Coast and the beautiful countryside of Breckland and North Suffolk. Boudicca Challenge - Enquire today! Arrival Night : We start you in the pleasant market town of Diss on the Norfolk/Suffolk border. Diss has a wealth of historic buildings and the famous Bressingham Garden and Steam Museum is only 2 miles to the West. Your accommodation will be in a 3 Star local hotel, or equivalent, and our package includes a full English breakfast every morning. DAY 1 : Today's the day !! After breakfast you head off west on Regional Cycle Route 30. Cycling on very quiet lanes and byways through gently undulating farmland and woodlands your first stop for coffee could be the historic town Thetford, regarded by many as the home of Boudicca's royal palace. More recently Thetford was the base for many of the episodes of Dad's Army and you can visit Captain Mainwaring's statue by the riverside. In the afternoon you cycle through the Forest towards Watton shadowing the ancient Roman Road known today as the Pedders Way. In the late afternoon you reach the sanctuary of the old Saxon settlement of Dereham. It's now an interesting market town in the very centre of Norfolk offering a wide variety of attractions:- vintage railway, cinema, modern swimming pool and Victorian Museum. You will be staying in one of the town's historic coaching inns – both offer very comfortable accommodation and great food. DAY 2 : A beautiful ride this morning alongside ancient meadowland and through historic villages towards Fakenham and the Norfolk Coast. Passing Gressenhall Rural Life Museum and near the Saxon Cathedral at North Elmham you'll probably stop for coffee in Fakenham before following Cycle Route 1 into the small pilgrimage town of Walsingham. With lots of quirky cafes and historic sites this is a great stopping place for lunch. It's then on to the coast; options to cycle through the 1500 acres of parkland at Holkham Hall and on to the vast and totally unspoilt beach at Holkham Bay or alternatively park your bike and explore the small fishing town of Wells-next-the-Sea which still has a fleet of working shrimp boats. Complete the day in an excellent country hotel near the Coast. DAY 3 : A day when you're spoilt for choice – our route takes you near many of Norfolk's best attractions:- the North Norfolk Railway, Sheringham Park, Shire Horse Sanctuary, Cromer Pier, Felbrigg Hall and many others ! Perhaps a lunch of famous Cromer Crabs or traditional fish and chips at the seaside village of Mundesley before tackling the quiet coastal section of Regional Cycle Route 30 and the run down to Great Yarmouth and the Norfolk Broads. Cycling past remote windmills and nature reserves you will arrive in the bustling resort of Great Yarmouth in the late afternoon. A short hop from Great Yarmouth takes you to our overnight stay in a 3 star hotel on the edge of Lowestoft. DAY 4 : Turning West, still on Regional Cycle Route 30, you are now on the final leg back to the starting point in Diss. The route follows the wonderful River Waveney valley and passes through the Norfolk Broads at Beccles and the quirky market towns of Bungay and Harleston. Before reaching Diss you can stop for a canoe or boat trip on the Broads, visit the Flixton Aviation Museum or explore the World War II Bomb Group Museum at Thorpe Abbotts. Arrive back at Diss mid-afternoon for a well deserved rest ! 25% booking deposit required in order to reserve your space for The Boudicca Challenge. Norfolk is a county in East Anglia, England. Bordering Lincolnshire to the west/north-west, Cambridgeshire to the west/southwest, and Suffolk to the south. Its northern and eastern boundaries are the North Sea and to The Wash. The county town is Norwich. With an area of 2,074 square miles and a population of 859,400, Norfolk is a largely rural county. Local bike hire is available from £25 for the Boudicca Challenge. Please enquire for details. Full balance is required 10 weeks before the date of the Boudicca Challenge. In addition, we also require the names, contact numbers and email address for each traveller. Please ensure all the members of your group have appropriate travel insurance. It is also a condition of travel with All Things Ride.